Chinese weddings are so cool! 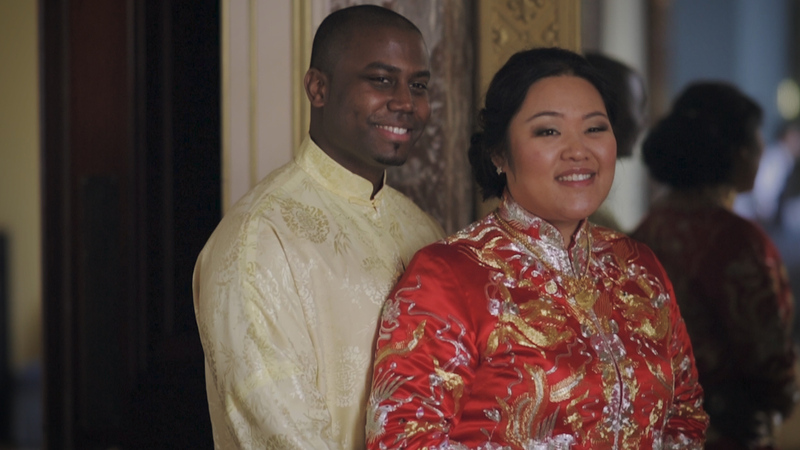 We’ve filmed a fair few now and I thought it was time we shared with you the intricate details of Chinese wedding traditions, from the fun of the door games in the morning, to the deep respect, love and gratitude expressed in the tea ceremony. 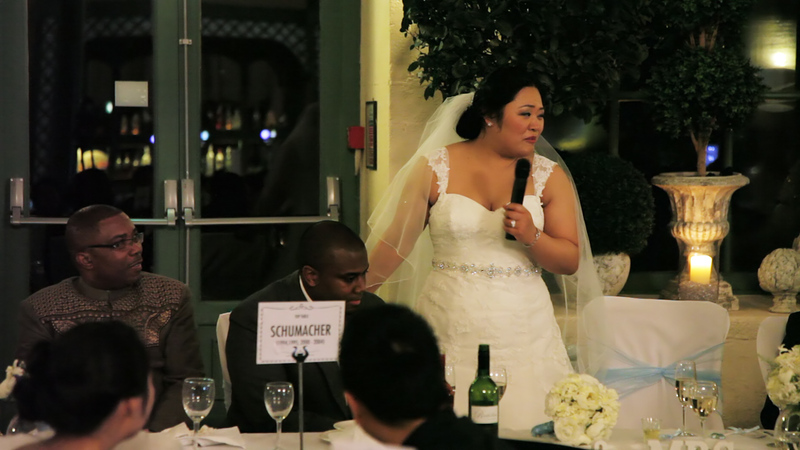 Who better to explain than a Chinese bride? I caught up with Mandy a couple of months after her wedding to get the lowdown on Chinese customs and find out what it’s like to organise a wedding that embraces both Chinese and western culture. What was it like planning the wedding? It was stressful, but a lot of fun. The hardest thing was packing everything into one day. I felt very strongly that I wanted to respect the Chinese traditions such as the door games and the tea ceremony, but the civil ceremony was really important too. It was a day in three parts: the tea ceremony showed our love and respect for my parents, the civil ceremony was the more romantic part of the day; that was about our love for each other as man and wife, and then of course there was a big party! Ouch! Sam proves his devotion with a chest wax! The Door Games are so much fun! – Can you explain what they are about? This is a tradition that goes back to ancient times. The idea is that the bride is a good girl from a nice family and the groom has to prove he is worthy of her. So when Sam arrived at my house in the morning he was blocked at the door by my bridesmaids and had to go through several trials to prove his love for me. The first trial was a traditional one to make sure he understood that love is not always easy, but brings with it a whole range of emotions. He had to consume the four flavours of love: sweet, sour, bitter and hot or spicy. So my bridesmaids made him drink sweet orange juice, then eat a sour pickled onion, then it was bitter lemon and lastly he had to down a shot of Tabasco sauce! Poor Sam! But that was a fairly tame test. When my cousin got married the groom and the best man were made to brush their teeth with wasabi paste! Some bridesmaids are meaner than others! The next trial was a test of strength. Sam and his groomsmen were made to do press-ups, which wouldn’t have been so bad except that it was snowing, so there he was hitting the deck in the icy cold! Next they had to don blindfolds, remove their shoes and socks and plunge their feet into a bucket of ice to retrieve some golf balls. This was a bit of a joke because my parents are such keen golfers! But the last test was the cruellest of all. Sam had to have his chest waxed. I don’t think my bridesmaids realised quite how hairy he is! Even they felt sorry for him as they ripped off the wax strip! After he has passed all the trials, the tradition is that the groom tries to buy his way into the house by presenting “Li Shi”, a gift of money in a red envelope. The bridesmaids traditionally ask for auspicious numbers such as £8888 or £9999. I was really proud of Sam because instead of trying to bargain with them, he just said “Mandy is priceless!” That was a good answer! What is the significance of the tea ceremony? The act of serving tea to parents and family is a way for the couple to show respect and express our love and gratitude to them for all they have done bringing us up. 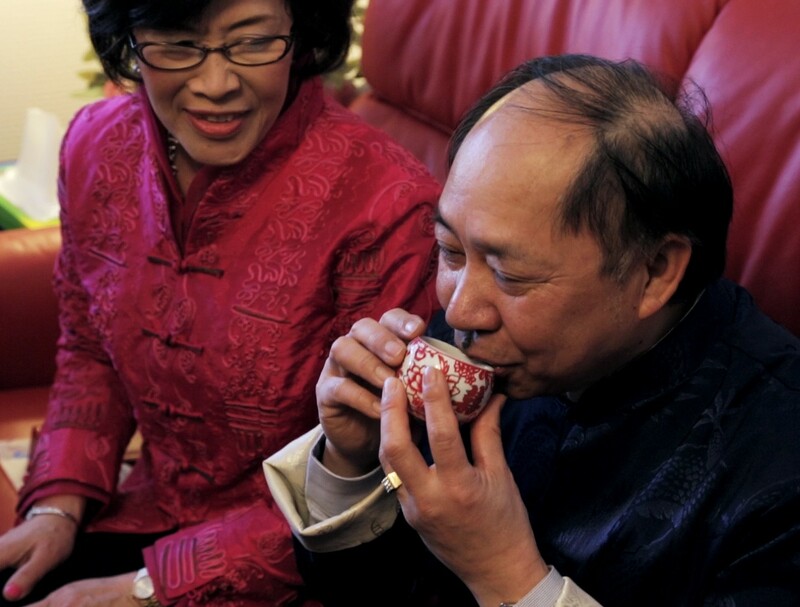 By drinking the tea, the families show they accept the couple as husband and wife. 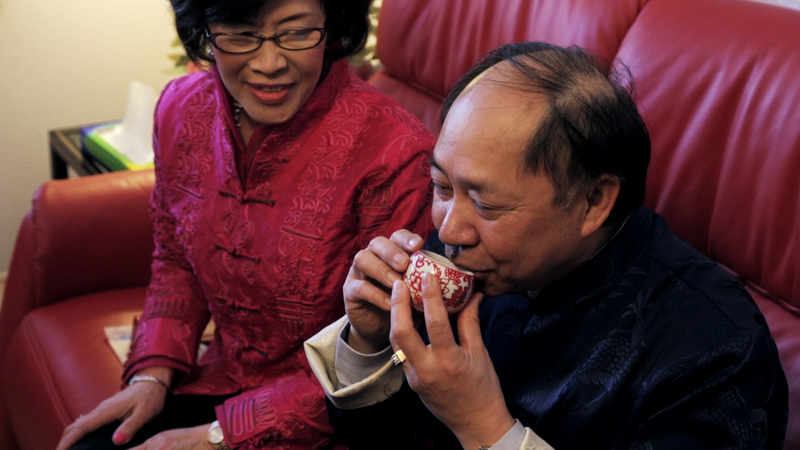 The tea is served by a “good luck lady” who is a female relative with a happy marriage and plenty of children. During the ceremony, she will say auspicious phrases to bless the newlyweds, wishing them a long and happy marriage as well as truckloads of children! The tea itself is deeply symbolic. It is made with lotus seeds and two red dates because the words “lotus” and “year,” “seed” and “child,” “date” and “early,” are homophones in Chinese, i.e. they have the same sound but different meanings. The ancient Chinese believed that putting these items in the tea would help the newlyweds produce children early in their marriage, which would guarantee plenty of grandchildren for their parents. It meant a lot to me to share the tea ceremony with Sam. These are traditions I’ve grown up with and as a little girl you always imagine that one day you will do these things on your wedding day. To finally have Sam standing beside me, showing his respect to my parents and to hear all the blessings that I know so well such as, “I hope you grow old together until you have grey hairs,” and “May your hearts become entwined,” that was very emotional for me. When the bride leaves her house, a bridesmaid will hold a red umbrella over her head, meaning “raise the bark, spread the leaves.” Red is lucky in Chinese culture. Because it’s such a strong colour, it offers protection from evil spirits, so the red umbrella protected me from evil as well as from the snow! Usually in Chinese tradition, we would then go to the groom’s house and have another tea ceremony, this time it’s a joyful celebration accepting the bride into her new home. We didn’t have time to do this on the day and we considered that the civil ceremony was a way of marking the occasion for Sam’s side. Sam’s dad is from Ghana and his mum is from Guyana, but is of Indian origin. We knew we couldn’t fit elements of all those cultures into one day as well as the western traditions of British society where we both grew up, so we are planning to have a big party in London to celebrate the African, Indian and West Indian traditions. I hired the dress from Hong Kong because they are extremely expensive to buy. Mine was actually a skirt and top in the traditional style of Southern China and of course it was red because that’s lucky.It was made with one piece of silk cloth and embroidered in silver and gold thread. The design, showing a golden dragon and a phoenix represents a balance of male and female power, which is crucial to a happy marriage. 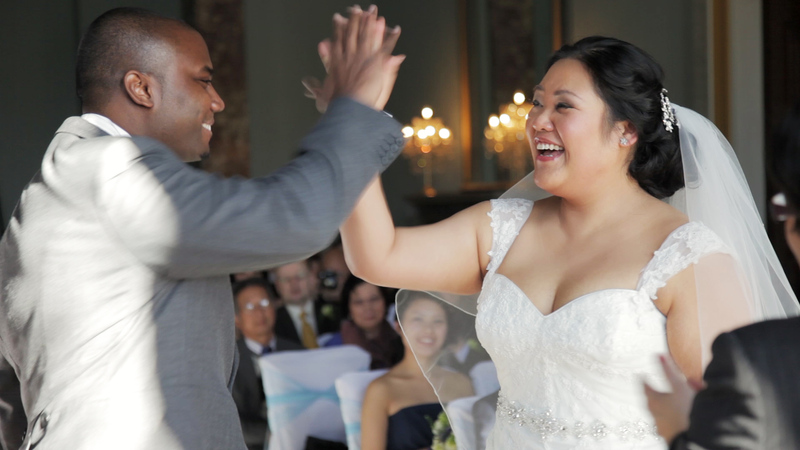 I really liked the way you high-fived each other at the end of the civil ceremony! How did that come about? That was a spur of the moment thing! The civil ceremony for me was really the romantic part of the day. It was about me and Sam and why we love each other. In a way it felt like we were in our own little bubble, and we felt quite comfortable to show our more playful side. We had written our own vows and we repeated the same words to each other. After Sam said his, he even stuck his tongue out at me! I think it was just his way of helping me with my nerves! But I felt good that we could share those little things. It was like we were saying this is how comfortable and great we are together. I can really feel all those emotions when I watch the video, and reliving it makes it even more special. What hit me and the majority of my family was when Sam hugged my dad and kissed him on the cheek. It was like, we can relax now, this is such a good man. It takes a lot to show that level of emotion. Mandy took the speech in her stride! 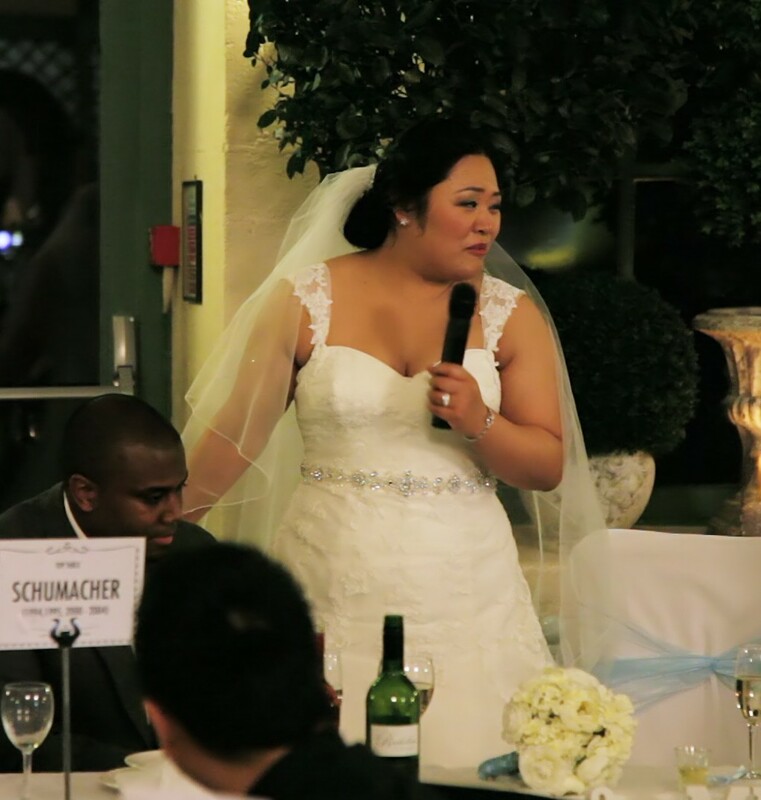 Brides are usually relieved they don’t have to give a speech! What made you decide to break with tradition? I guess I just wanted to make it clear that every single person in that room had touched my life in some special way. I just wanted to show my love and gratitude to everyone. For the wedding breakfast we didn’t have a traditional Chinese banquet but my parents wanted us to have a kind of gala dinner with several courses. At the beginning my father welcomed everyone then we had the starter and main and took a break to observe the Chinese tradition of toasting every single table in the room. In a traditional banquet that usually happens after about the fourth dish. Then it was back to the western routine. I really enjoyed watching the speeches on the video. Your first dance was so much fun! How did you prepare for it? Sam used to do bodypopping lessons a few years back with dance instructor Robert Gregg, so we contacted him and he choreographed a dance to include all our favourite styles: bodypopping, locking, and boogaloo. Sam picked a slow dance tune and a fast one too so we could really express ourselves. Then we took Valentines weekend and Robert just taught us non-stop for two days. It was really intensive but so much fun! Then we had to keep practising! 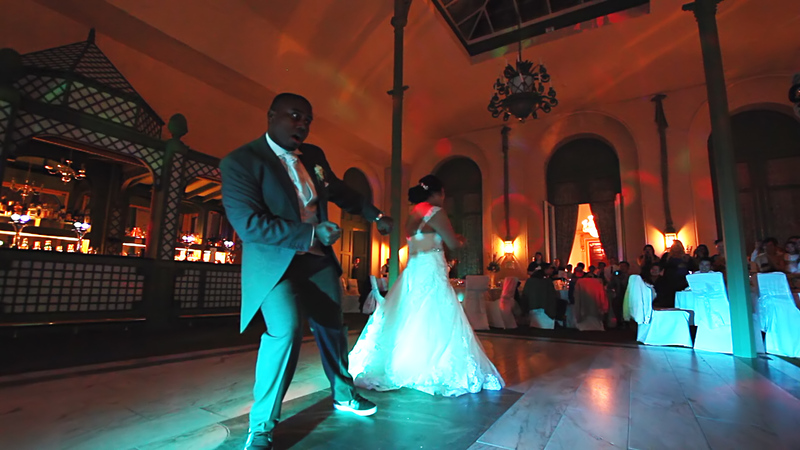 Mandy and Sam’s chinese wedding videography first dance rocked! 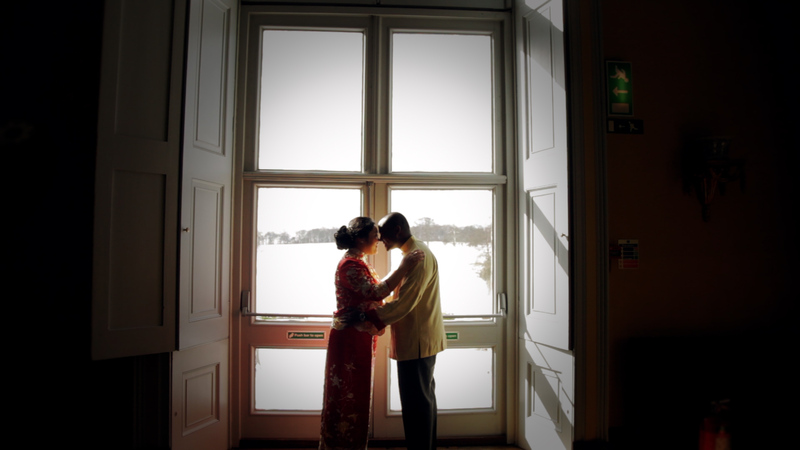 We had a pre-wedding shoot in Greenwich with our photographer, Helen Russell. It’s becoming fashionable for Chinese couples to have a pre-wedding shoot wearing a full wedding dress so I bought one on Ebay for the occasion. It came in very useful when I was practising the dance at home, because dancing in a full skirt with a hoop is nothing like dancing in your normal clothes. That’s a tip for other brides, if you’re practising your first dance put a hoop over your jeans or something, just so you can get the feel of wearing a full skirt! Would you say it was even more important to you to have a video, as a kind of record of all the Chinese traditions that you observed? Oh yes, definitely. On the day it all went so quickly, but it’s brilliant to have that record. The edit is amazing! I knew Guille would capture the day so that we can relive the big moments and be reminded of the little details of the day. I never thought we would relive the actual feelings again! Guille also recorded video messages from many of our guests who only speak Chinese. This was so important to me because I couldn’t have a traditional guest book, as I can’t read Chinese, I just speak it. The video messages were like a video guest book for me and it’s great to have the messages and advice from my Chinese relatives preserved forever. Sam and I asked each other on our honeymoon what words described our wonderful wedding day: so much love we could burst! Joy, romance, amazing family, thankfulness and fun! The film brings back all the above!! We are so happy!! Absolutely love it!!! Thank you for helping Mandy and Sam capture their big day so beautifully! Thank you Guille & Rick! Thank you Jo! Thank you Viva La Wedding! For a beautiful wedding video that we will cherish and enjoy for many years to come! Thank you John! It really was an amazing day and yes, Mandy and Sam sure know how to move! Just had a look at your web site. Some lovely work on there!